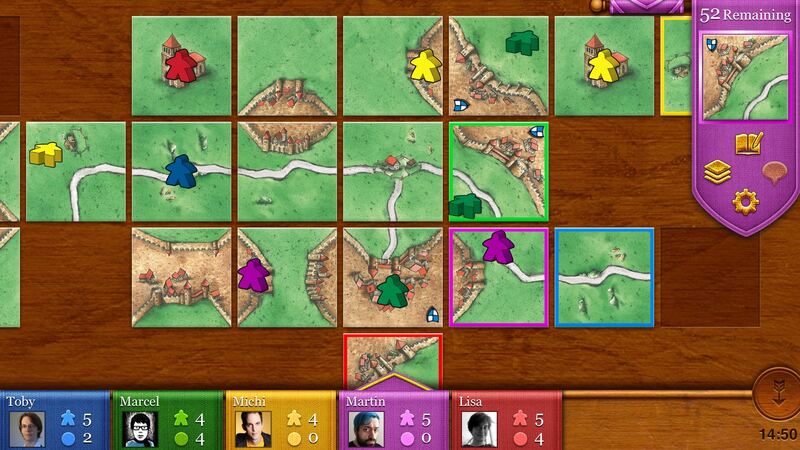 Carcassonne is a German-style board game played by placing tiles and game pieces on a table. 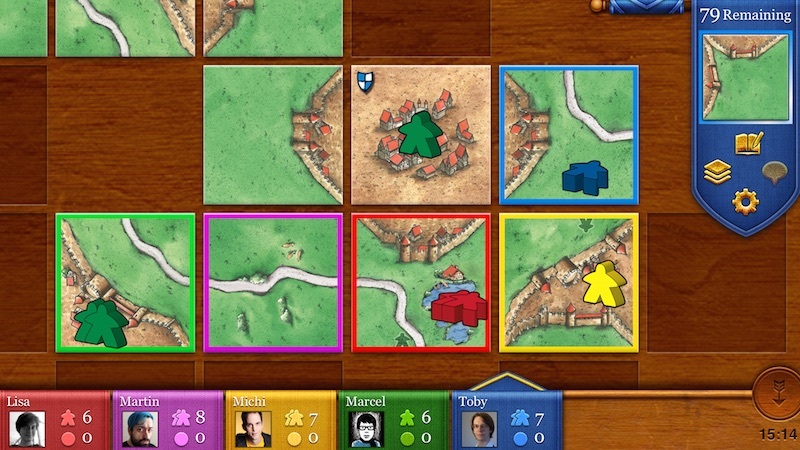 While playing, a medieval world of towns, roads and fields unfolds on the table. 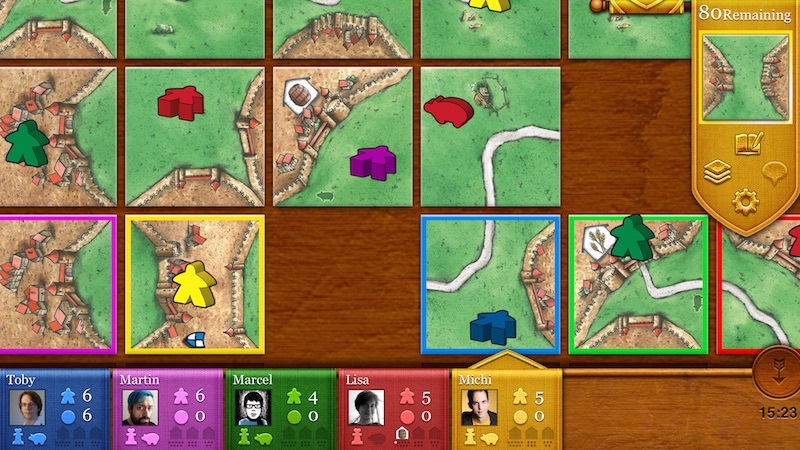 Carcassonne for iPhone and iPad keeps all the charm of the board game and adds features only a digital board game can provide, like networked multiplayer or taking care of cleaning up the table after a game. Like the board game, we add new expansions from time to time. They are sold as in-app purchases and can be combined as you wish. We are bring those expansions first, that are most eagerly awaited by players. Let us know if you are missing your favorite! A cold winter has wrapped the walls of Carcassonne. The citizens waste very little time before preparing hot beverages and sweet pastries. 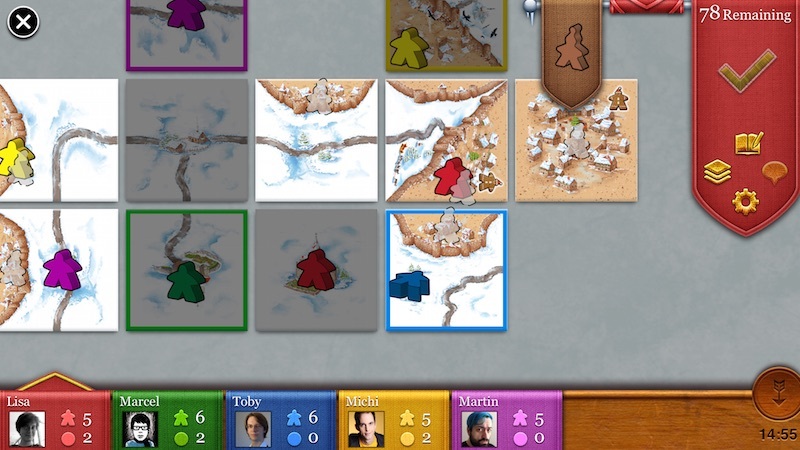 Includes a winter base set, twelve additional new tiles, six Gingerbread tiles and a Gingerbread Man. 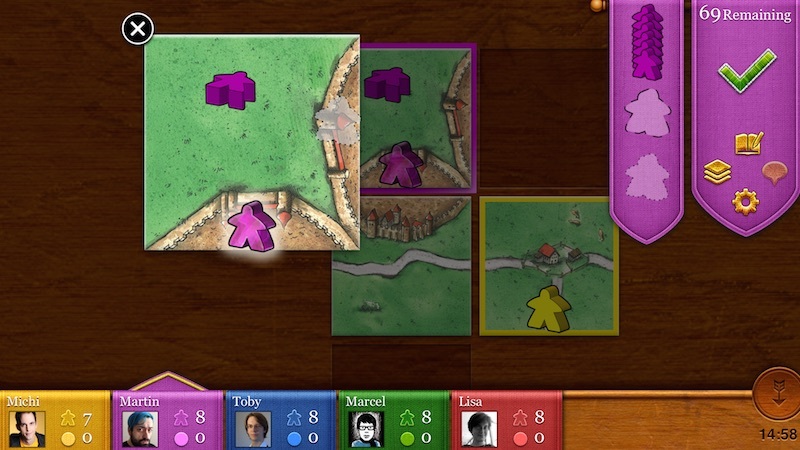 The phantom is a ghostly meeple that can be placed in addition to your normal meeple each turn. Includes a new piece. The dragon lays waste, the princess kicks meeple out of her castle. The fairy grants protection and bonus points, magic portals teleport meeple. Includes thirty new tiles and a four new pieces. The builder gives you additional turns. The pig makes one of your fields more valuable. Collect goods for additional points at the end of the game. Includes twenty-four new tiles and a two new pieces. The double follower has twice the power of a mere single one. Inns double the value of a road, while Cathedrals add a bonus point per city tile. But beware: They are risky, because unfinished settlements have no value at all. Includes eighteen new tiles and a new piece. A river flows through the countryside, dividing fields, cities and roads. 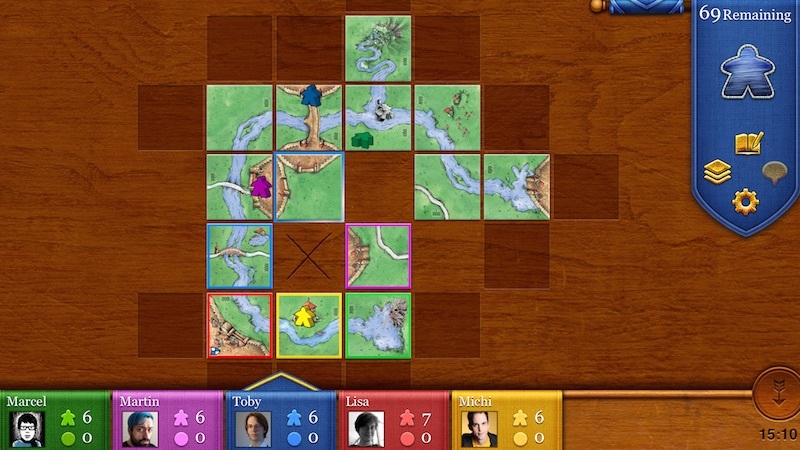 Lay out your river wisely in the beginning of the game to gain a strategic advantage later. 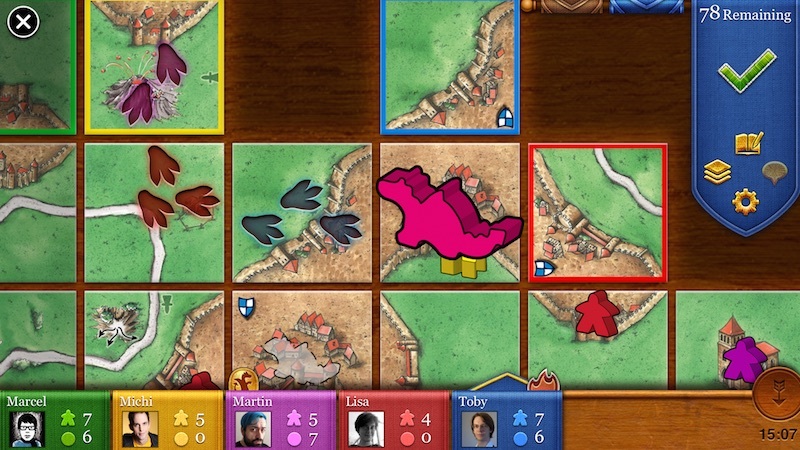 Includes twelve new tiles, which are played right at the beginning of the game. For support, questions and anything else you can easily reach us via email. We have a press kit available, if you are looking for basic information, images and videos about Carcassonne. Please let us know immediately if we can assist in any further way. How do I restore my expansions? Can I play with expansions in quick play? Yes. However currently we limit the combinations of the expansions in quick play to avoid fragmentation of the player base and longer waiting times for games. We try to give three or four useful combinations for quick play. Can I play against my familiy or friends by passing the device around? Do I need to buy the expansions to participate in a game with expansions? If you are playing local network multiplayer you can share an expansion with your opponents. To play online multiplayer, you need to buy the expansion to play with it. Help! I’m trapped in a game! Try opening this link in your iPad’s or iPhone’s Safari.